Pool algae can be a nightmare, and knowing how to prevent it and remove it is crucial. So, unless you enjoy the thought of having green pool water, or noxious coloured spots staining your pool, read on. Algae are microscopic plants of which at least 20,000 different species are known to exist. Of these, there are a number that enjoy nothing more than the opportunity to take up residence in your swimming pool. They are not, as a rule, dangerous – but they are ugly, and they are deeply, deeply annoying. The only real danger is that they can, if not properly treated and controlled, become home to a secondary infection of harmful bacteria including e-coli. Green algae is the most common kind of algae that is likely to afflict your swimming pool. But just because it’s common, that doesn’t mean you should underestimate it. Green algae is generally free-floating in the water, and often the first sign that it has arrived is that the pool water begins to look a bit cloudy. However, what might start out as nothing more than a slightly opaque water quality can suddenly blossom, spread like wildfire, and in just a few hours transform your pool from a sparkling oasis into a noxious looking green swamp. Alternatively, green algae may also attach itself to pool surfaces, commonly in areas where the water circulation is low. The first warning sign for this may be that you notice that the surfaces feel unusually slippery. Again, if not dealt with quickly, these can rapidly spread to cover entire sections of the pool wall with sheets of green slime – to the point where your once glistening pool suddenly resembles nothing so much as a location shoot for a Ghostbusters movie. Yellow algae – or, as it is otherwise know, mustard algae – first appears in small clumps on pool walls and floors, usually in the more shaded parts of the pool, and may have a powdery or dusty appearance. If left untreated, the clumps can coalesce and form into sheets. Some of its favourite places to establish a first foothold tend to be behind pool ladders or under slides – anywhere in your pool where sunlight is being blocked. The good news (such as it is) is that yellow algae growsless rapidly as green algae. The bad news is that it’s harder to kill. That’s because yellow algae protect itself with a slimy outer coating which, unless you can break it down with vigorous brushing, effectively defends the algae against chlorine. Additionally, the spores of yellow algae are considerably smaller than those of green algae. As a result, they are capable of passing right through the pool’s filtration system. What that means in practice is that, even when you think you’ve scrubbed it off, yellow algae can quickly and easily return to the pool. Worse yet, if not dealt with in a suitably robust manner when it first appears, yellow algae has a nasty tendency to come back from the dead and, like some kind of psychotic zombie apocalypse, re-germinate itself – only this time with a super-virus like resistance to chlorine. Actually, it’s more than just a resistance; when yellow algae re-germinatesit comes back with the ability not just to fight off, but actually to destroy the normal chlorine levels in your pool. If you thought that green algae and yellow algae were bad, just wait until you get a load of black algae. This is the worst kind of algae for your pool. In fact, in the horror story world of pool maintenance, if green algae is the Swamp Thing, and yellow algae is the Night of the Living Dead, then black algae is Freddy Krueger from Nightmare on Elm Street. The first signs are usually small black or very dark blue-green spots, no more than a centimetre or so in diameter, on the floor or walls of your pool. 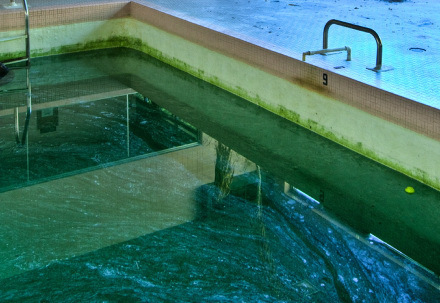 The interior of pool skimmers is a favourite and notorious initial breeding ground for black algae. The first ones to appear in your pool will usually be in shaded areas, and especially around any cracks, crevices, or other imperfections in the pool surface. But, before you know it, these spots will grow first to the size of coins and then to the size of dinner plates. Ultimately, they’re quite capable of turning your entire pool surface black. What makes black algae so perniciously unpleasant is that the algae spores anchor themselves to the surface of your pool, and then begin to take root. These roots are strong, and they proceed to burrow their way down into and through any crack, crevice, or porous surface, such as plaster or tile grout. Worse yet, the roots then rapidly expand like some rampant and invasive weed to form an extensive network between the pool’s surface and the underlying concrete. And it’s only then that the first spots appear on your pool. So, by the time you actually see the first signs of black algae, it’s already established itself. That spot you’re looking at is actually the head of an entire colony. If you’re not already cowering behind your sun-lounge in terror, the bad news is that there’s more horror to come. Unlike yellow algae, black algae doesn’t seek to protect itself with a layer of slime; it protects itself by forming a series of layers that end with a hard, waxy outer coating. The net effect is that the underlying organism is safe from chemical attack. Plus, even if you scrub off the head, unless you also succeed in completely destroying the roots, then, just like some malevolent Hydra, another head will simply spring up in its place. Strictly speaking, pink algae isn’t actually algae. Although it has similar properties to algae, it’s really a kind of fungus that results from rapidly growing colonies of bacteria. Pink algae usually first appears as small pink or reddish spots. 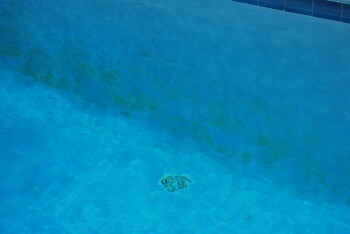 It tends to form at or near the bottom of pools, in corners, around pool ladders, and in other similarly shaded areas. Alternatively, it may first appear as a pink or light red slime at the edge of the pool’s water line. This slime is the coating that protects the bacteria colony. The good news is that pink algae spreads fairly slowly, is usually located only in certain areas, and it is rare for it to take over an entire pool. Also, if caught early enough, it’s relatively easy to remover. However, because the bacteria that causes pink algae to form in the first place exists naturally in the air, recurrence can be persistent. What Causes Pool Algae to Occur? Algae are living organisms that grow, perfectly naturally, in any number of aquatic environments such as rivers, streams, ponds, lakes, and oceans – or in your neighbour’s swimming pool. They are also commercially farmed as a health supplement and, increasingly, for biodiesel fuel. The algae spores are produced by algae that has dried outand been born by the wind or the rain and deposited in your pool. The spores can also be introduced by un-properly washed swimsuits, un-rinsed off lilos, etc. This is especially the case for black algae which occurs naturally in the ocean. The point is that your pool is under constant bombardment from both spores and bacteria. Once in the water, all they need to do is wait around long enough until the conditions are right for them to bloom. Pool algae prefer warm water, and sudden algae bloom occurs most often in such pools. Green algae contain chlorophyll, and, just like plants, grow through a process of photosynthesis. And, just like plants, green algae flourishes best in sunlight. Algae thrive on nitrates, so if these are introduced to your pool (e.g. by fertilizers) they will cause algae to bloom. It’s also why green algae frequently blooms after a thunderstorm – the rain and lightning reduces the pool’s chlorine level and introduces nitrogen. 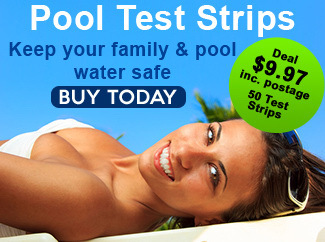 The higher the pH level of your pool, the less effective is chlorine in killing off algae. Lack of Proper Circulation Poor circulation can help algae to thrive. Especially relevant to introducing bacteria to the pool that may create pink algae. Once it has taken hold, getting rid of pool algae can be a bit of a process. However, with a little determination and patience all but the most extreme cases can be dealt with. 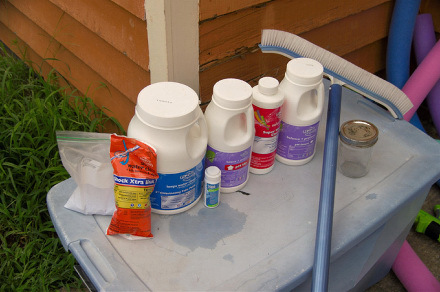 The following are the steps for treating general cases of the algae types discussed above. The point here is to remove as much organic material such as dirt, leaves, and bugs as possible. Organic material will absorb the effect of the sanitiser (see Step 4), so you want to clear it all out to give the sanitiser the maximum opportunity to focus on zapping the algae. Don’t brush the pool yet; all that achieves is loosening and breaking up the algae. That’ll come later (see Step 5). You need be sure that your pool can circulate as cleanly and efficiently as possible. If you have a sand filter, backwash it. Check that the pH is between 7.4 and 7.6. If it’s not, adjust it accordingly. Algae can grow between 6.5 and 12.5 pH, but 7.4-7.6 pH enables chlorine to be at its most effective and also maintains the other water balance levels. Sanitise or shock the pool with trichlor – 1 gram trichlor per 25 litres of water. If you have a vinyl pool, a dark coloured plaster pool, or a dark painted pool, be warned that trichlor at this strength may bleach your pool surfaces: use liquid chlorine instead at 30,000 ppm (parts per million). Don’t sanitise the pool during the middle of the day: UV rays from direct sunlight reduce the sanitiser’s effectiveness. Start the process in late afternoon. What you’retrying to do is to break the bonds the algae has on the surfaces. With pink algae you’re also trying to break up its protective layer of slime, and with black algae to break open its head so that the chemicals can get to work on the underlying organism and into the roots. Ensure that you brush all the surfaces thoroughly – whether or not they appear to have algae. And brush any pool ladders, slides, etc. Run the pool filter pump constantly for 72 hours so as to give the sanitiser a chance to do its job. During this time, make sure to brush the pool surfaces at least once a day. Also, test the pH level regularly (once later on the first day, and then twice a day for the next 2 days), and maintain the chlorine level at 6 ppm. Since your filter is going to be dealing with a load of dead algae, make sure to clean your filters frequently so that they don’t become clogged. Also, vacuum the pool frequently to remove dead algae from the bottom. Finally, continue to brush the surfaces frequently – even if you can’t see any trace of algae. You can go back to your normal maintenance after the 7 hours and when the chlorine levels returns to 3ppm. If you have an especially stubborn or serious case of algae – particularly for yellow or black algae – you may need to adopt more aggressive tactics. First of all, repeat steps 1 through 7 as above. Green Algae: You’ll know the second shock treatment has worked when your pool water turns from green to bluey-grey. That’ll be the dead algae. Yellow Algae: If you can’t exert sufficient brushing pressure with pole brush, be prepared to brush the visible spots by hand. If they’re in deep water, you may need to put on a mask and do it the hard way. Black Algae: Use a stainless steel wire hand brush to break through the hard protective covering of the algae spots, and then pour some tri-chlor directly onto them. You can try doing this without draining your pool as long as you turn off your pump.If that doesn’t work, be prepared to drain your pool down to the affected area if it’s on the walls, or completely if it’s on the floor. In the worst cases where the black algae roots have completely taken over, it may necessary to apply an acid wash, or even to resurface your entre pool. Pink Algae: Usually the first sanitiser shock will do the trick, but if it doesn’t try repeating the process but with the pool’s pH level adjusted to between 7.2 and 7.3. As their name suggests, algaecides kill algae. However, not all algaecides kill all types of algae. And, despite what advertising companies might suggest, they’re not a replacement for the above described determination and patience – they are an auxiliary, albeit powerful, weapon system. But they are not always without their limitations and drawbacks. Copper Sulfate or Copper Complex or Cupric Ammonium Complex. Traditional sailing ships didn’t have copper sheeting nailed to their hulls for nothing; they were there to prevent barnacles and algae from growing on the ship’s underside. That’s because copper prevents algae from breathing or eating.Copper Sulfate based algaecides do the same thing, and they’re effective against all types of pool algae. The only problem is that they have the potential to cause a bluey-green stain on the surfaces of light coloured pools (and swimmers’ hair). Colloidal Silver. Silver has the same effect on algae as copper. Also, except in very extreme circumstances whereby it is exposed to very bright sunlight and very acidic pool water, it has no dyeing risk. Polymers. These are chemical compounds created and marketed with the prefix “poly”. They work best against green and yellow algae, and there are different polymer products specific to each.They don’t really work well against black algae, unless used in conjunction with a copper sulphate algaecide (Poly 60 mixed with a copper sulphate algaecide can be effective, but you need to monitor carefully the combined chlorine level of your pool). Quaternary Ammonium Compounds (Quats). These work like polymers, but are generally only effective against green algae. Chlorine Boosters. These work by effectively turbo-charging your chlorine. However, they work best against yellow or green algae. Maintain a consistent pH balance between 7.4 and 76. Maintain the chlorine level at 2-3 ppm. Try not to let fertilisers or fertilised lawn run-off enter the pool. We would love to hear about your experiences with Green Pool –Guide to Preventing & Removing Pool Algae. Please leave your comments below and share the article with anyone you think may be interested. Great advice. Tks for the advice. It won’t be an easy job and it maybe easier to drain your pool then clean it all that way. Other than that, just follow the steps in the guide. Skim, scrub walls and floor, let the water settle for a few hours then vacuum. You’ll need to continuously clean your filter and repeat this process over several days. When you’ve got the worst out, start running your filter and shock the water with a high dose of chlorine. You may also need to invest in some algaecides. I feel your pain but keep at it and you will get there. I hope this helps. Beyond frustrated. Have spent hundreds (closer to 1000) dollars on trying to get rid of algae on the surfaces of my gunite pool. Not happy with leslies. They have had me purchase 3 large jugs of Green to Clean. 3 different applications have not worked. I get the ph to 8 as suggested…follow directions exactly….and nothing. The water is crystal clear, but the green algae won’t come off with wire brushing….and I’m scrubbing hard! i suspect you were told the wrong info. I have pink algae which I’ve read is caused by a bacteria organism. I can not get rid of it after 2 treatments recommended by the pool shop. What’s the best vacuum head to attach to your tubing that can remove the really light weight dead algae on the bottom of the pool? The automatic robot sends it flying back through the pool as does a vacuum head on wheels. Great post. This is a very well written and very detailed information. Thanks for sharing! Would like to know, do these algae come off pretty quickly and how many times do they usually get cleaned? I have a gum tree in the back yard about 8 mt away from the pool ,but when the wind blow the leave off the tree fall in the pool all the time .. How can I keep to pool clean all the time when this happen ,I have a saltwater pool with a sand fitter .. If you don’t want to be out there 3 hours a day cleaning, the best way is to cover your pool up with a pool cover. If you use it regularly, use a cover that comes with a roller. These are some amazing tips! Pool maintenance is not easy but it’s impossible to do too. We are a pool and spa supplies and parts seller. Pool owners and contractors can easily find the parts they need for repairs or maintenance. I believe in professionals so this is a very useful article for everyone. Great content, very useful information. Thank you for sharing. Hi, I have an 875 gallon rectangular vinyl pool for my 4 yr old and recently covered the sun exposure with a rectangular Sunbrella cover (blocks 95% of UV) to protect him while he swims. Once under cover, it has started to grow what looks to be yellow algae. Is it possible to keep the cover and get the algae under control or will this continue to happen if kept covered?